Sheet Metal Punching | Columbus Engineering Inc. While often considered limited in versatility compared to a laser, turret punch presses have capabilities in certain applications unmatched by lasers. High volume runs are a perfect fit for a turret punch press. Using a combination of different punch geometries, nearly any shape can be reproduced on a turret punch quicker than on lasers. 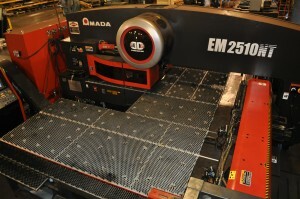 Columbus Engineering Inc. has 2 Amada EM 2510NTs on the shop floor used for sheet metal punching. Up to 500 hits per minute. The Amada EM is one of the fastest punches on the market today. Accepts sheets up to 50” X 99.5”, with repositioning capabilities we can run sheets much larger in length. Accepts sheets 50” X 72”, with repositioning capabilities we can run sheets much larger in length. We have a large inventory of turret tooling, including rounds, squares, rectangles, and obrounds.